We all need a little ‘pick me up’ every so often, and with the time of year we’re in slowly filling up with more and more social occasions we’re probably all in need of a hangover cure. 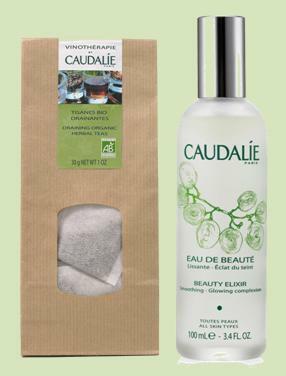 Caudalie have launched two new products which are perfect for party season, but also for refreshing your spirits all year round. I’ve been into facial spritzers in the past as they can be a really useful and simple way of livening up your skin. The new Beauty Elixir contains orange blossom, mint, water and essential oils to ‘awaken the complexion and mind.’ The scent is delicious – you really get the freshness of the mint coming through – and definitely wakes you up and makes you feel a bit more alive. It can also be used over makeup without smudging it, so this is perfect for keeping by your desk to wake you up after the 4pm slump. I do like a herbal tea. I have so many flavours and varieties in my cupboard I’m practically on first name terms with the guys in Whittards. But now a cosmetic brand launching a tea? At least it’s original! Caudalie’s herbal tea contains detoxifying infusions of red vine, blackberry, blueberry, orange peel and cinnamon – which smells absolutely delicious. The cinnamon really comes through when you soak the teabag and smells a little bit like Christmas. Each pack comes with 20 bags in a really cute paper pack so you’re also doing your bit for the environment. Three cups a day is supposed to detox your body, get rid of excess water and aid slimming – that’s one clever tea. It tastes really nice too, not too strong or herbally, but you still get the flavours coming through subtly. I can totally vouch for these two products today. I have had the mother of all hangovers and these were the first two things I reached for… each waking me up a little bit and enabling me to at least get up to go hunt down pizza. I’ll be stocking up on these in the run up to Christmas and so should you!